Frank Mazzocchi has been a farmer for over half a century but in all that time he’s never bought a new item of machinery — and that includes farm trucks. In fact Frank’s only ever owned three trucks, and he won’t be buying a fourth, the way his ‘newest’ workhorse is performing — a 1979 International Acco 3070 tipper. 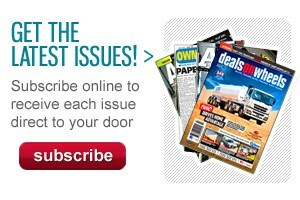 "It’s been a very good buy," Frank, from The Rock, near Wagga Wagga in south western New South Wales, says. "Nothing’s gone wrong with it, except for a few air leaks. There’s not an oil leak in it, from the diffs, the gearbox … by gee she’s very sound in that way." Frank, 70 this year, bought the old Acco for $15,000 seven years ago at a clearance sale after he happened to be visiting his brother-in-law near Coffs Harbour. The previous owner had spent a similar amount of money on it, putting in a new diff and power divider as well as new pins and bushes in the front end. 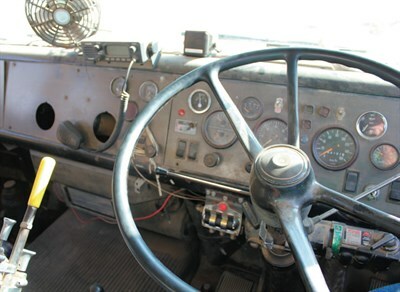 The old Inter has a V8 903 Cummins, with a 15-speed Roadranger gearbox using old buttons you never see these days. 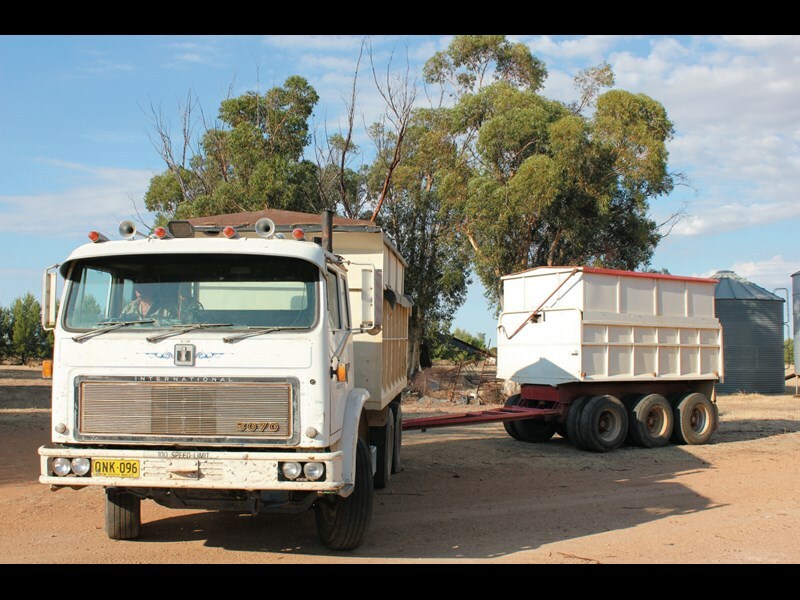 Its former life was as a gravel tipper with trailer, putting 830,000km on theclock. Frank’s only added 15,000km, trundling between his property and public silos 10km away at harvest time, using special harvest-only registration. The rest of the year Frank fires the Acco up every month or two and gives it a "good run" for 10 or 15 minutes. He does all the services himself. Frank halved the number of trips to the silos a few years ago buying an old "pig" trailer for $10,000, meaning the combined payload of mostly wheat or canola is now 22 tonnes. As Frank points out, the NSW road authorities aren’t real fond of pig trailers. They have three fixed axles, so are unable to turn at the front axle, which puts extra strain onto both road surfaces and tyres. 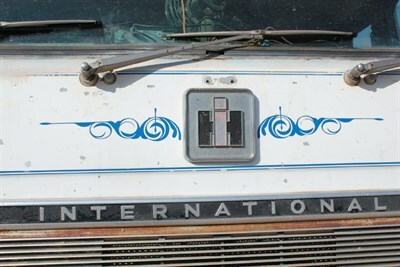 The old Acco has a ‘100 speed limited’ sign on the front but there’s no need to display it. Frank reckons his top speed is only 50km/h on the quiet country roads. Even at that speed the old Acco is rough: "By gee she does bounce up and down," Frank laments. "And she’s very light on that power steering too." Driver comfort was not one of the things these older Accos were renowned for; in fact they were a bit "agricultural" (excuse the pun). But they had many good points. The current boxy Australian-designed and built cabover Acco had its 40th anniversary last year, after first rolling off the International Harvester production line at Dandenong in Melbourne in 1972. The brand is now owned and built by Iveco, and more than 70,000 have been manufactured. So who better to ask about 1970s units than a bloke who sold a stack of them — Frank Mazzocchi’s good mate, and my old man, Mick Skinner. "Acco’s overall were an outstanding truck," Mick says. "They had wonderful tare weight, wonderful load distribution onto the front axle, good fuel economy, they were reliable, and they were cheap. "They were easy to sell and easy to buy, and operators didn’t trade out of them too regularly." 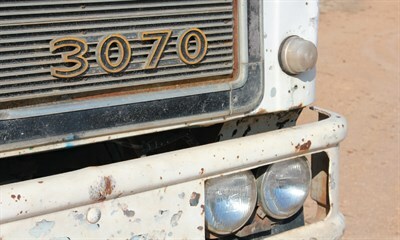 Having said that, Mick wasn’t a big fan of the 3070 with the 903 Cummins — at least as a highway prime mover, which he remembers International attempting without much success. "At highway speeds the 3070s overrevved, overheated and guzzled fuel,"
Mick recalls. "However, properly marketed as a medium-range unit, like a tipper or a local prime mover, they could have been more successful. That old one is perfect for what Frank needs." International already had a big highway-specced prime mover at that time anyway — the Atkinson. Things have changed a lot in farm grain cartage since a young Frank Mazzocchi used to load 80kg bags of wheat onto an old 5-tonne tray-top by hand. These days he says most farmers have semi-trailers and contractors run B-doubles into the silos. There are quite a few tippers and trailers too, but he hasn’t spotted any as old as his. 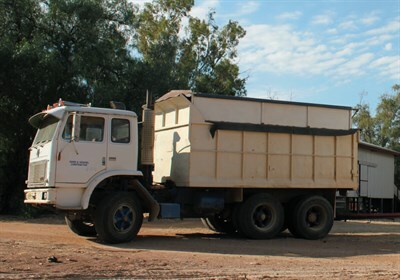 However, a couple of his mates still run little 1960s-era tray-tops with grain bins, like the 1968 6-tonne Thames Trader which Frank still uses occasionally around the farm: "It was a good solid old truck". Frank’s wife, Carmel says the Thames is like a ute to drive, but the Acco has too many gears for her. "Frank respects his trucks and he looks after them. He doesn’t change them very often," she adds, in something of an understatement. Meanwhile the youngest of the couple’s three daughters, Caroline, used to drive the Thames’ farm predecessor — a little old 1955 5-tonne Bedford – at the ripe old age of four. During a drought year Frank got Caroline to "drive" the Bedford while he poured grain off the back to hungry sheep. He’d get the truck idling along in first gear, stand Caroline on the seat in front of the steering wheel, and tell her to hold it straight until he called "Stop" — at which point Caroline would pull the choke all the way out. "She loved it but she only did it until she went to school — she got too old then," Frank laughs. Frank’s supposed to be retired, with his son, Michael taking over the farm, and his health hasn’t been too flash after contracting Ross River fever. But he expects that if the next harvest is a good one, he’ll be chugging into The Rock about 50 times in the old 3070. "I’m the main driver at the moment but it all depends. I might be sacked," he jokes. 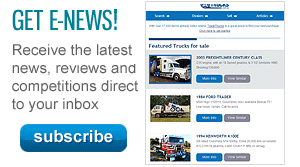 Find International trucks for sale.